The North Peak as seen from The South Peak of Mt Arayat. Mt Arayat is an extinct Stratovolcano proudly standing like a lone Island in the flat plains of Pampanga with 1,026 MASL, with steep slopes littered with Rock Boulders, pristine trails within forested areas that passes through the broken Caldera that we now call the Northern and Southern Peaks. This mountain stands with a proud silhouette all over the towns that surrounds its base, it cast a wide shadow that it can be seen even from neighboring provinces like Bulacan, Nueva Ecija, Zambales and Bataan. Mount Arayat is an extinct Stratovolcano. Rising to a height of 1,026 MASL (3,366 FASL). Located within the Municipality of Arayat and Magalang, Pampanga. 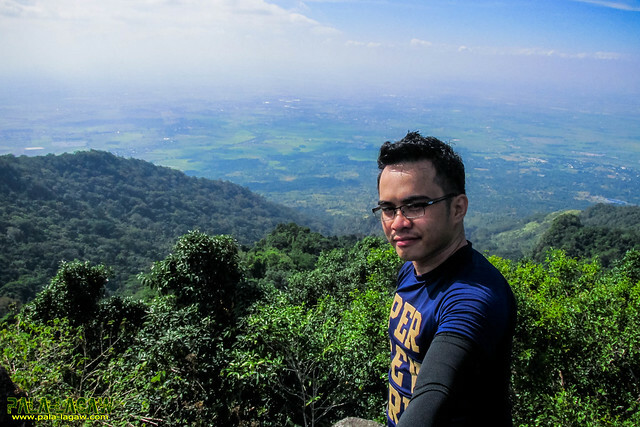 The blogger has traversed Mt Arayat on the same Ayala - San Juan Bano Trail twice last September 2014 and January 2015. See Chased By A Typhoon In Mt Arayat. Assault via Brgy Ayala, Magalang, Pampanga, North West of the Mountain where large grottos of Stations of the Cross are placed. 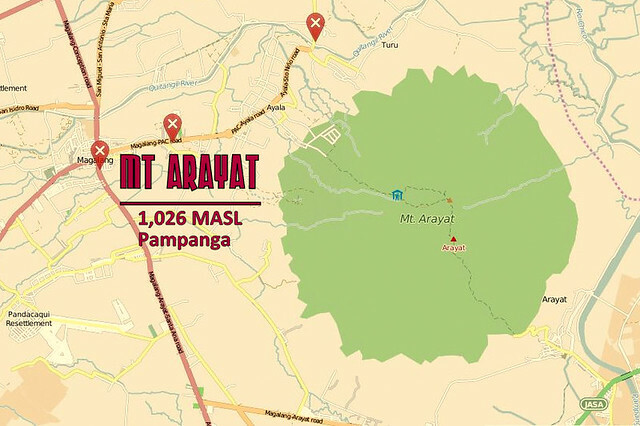 The new trail is established following the power lines reaching the Mt Arayat North Peak Campsite at 1026 MASL where the Telecom tower is situated. 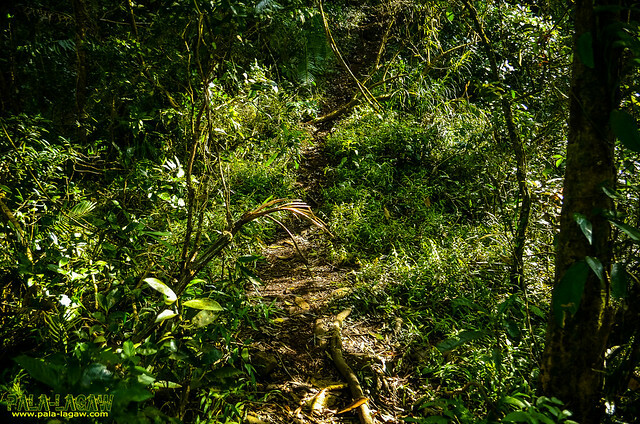 This trail is forrested with many tree tunnels making the hike easy. Not much challenge except the continues steep slope with few Rock Boulders. This side of the mountain has trail markers in yellow, painted in rocks and huge boulders. 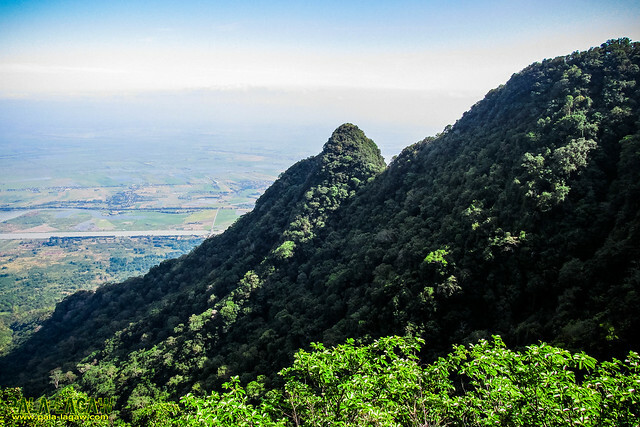 The North Peak campsite is a bare patch of land, the highest point of Mt Arayat itself. 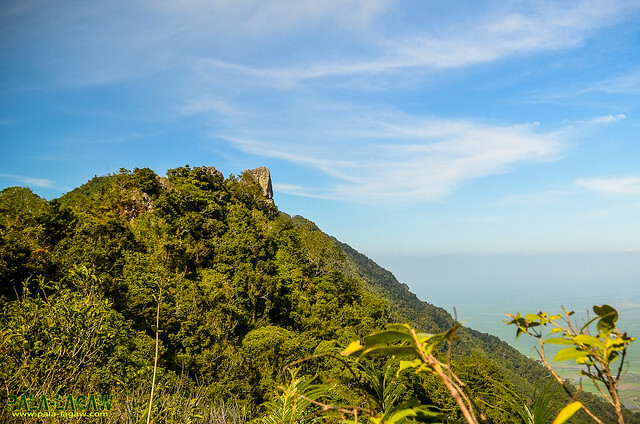 From the North peak, descending to the South peak has a few challenge especially to first time hikers. Vertical clay and Rock walls with rope segment abound making this a Technical Climb and not easy after all. The Andesitic dome known as White Rock is along the way and once the South grassy peak is reached, you can look back and realise that you just circled the broken Amphitheater like Caldera. 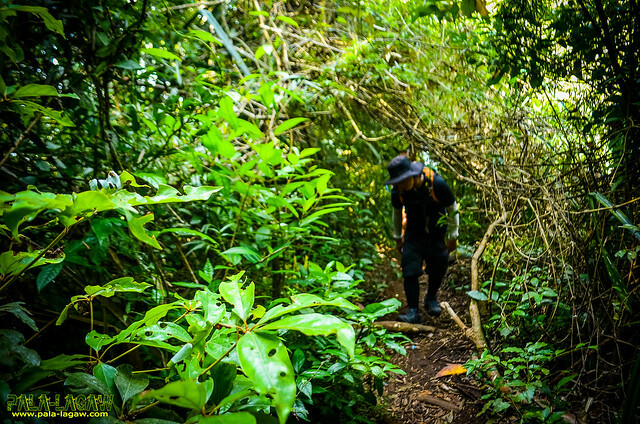 Thickly forrested trail, Banyan Trees with extended long vines constantly block the way, creeping Bamboo grasses are abound too. 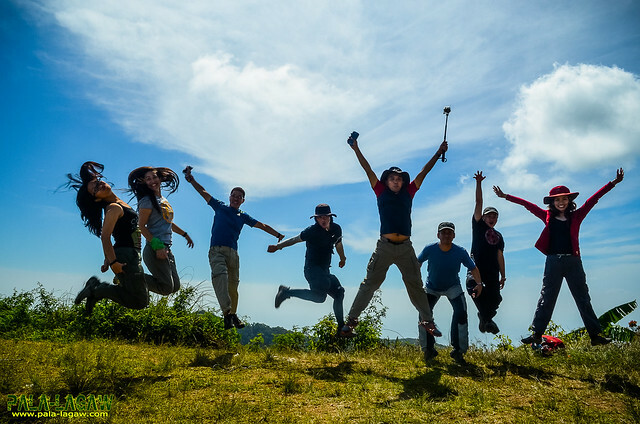 Once the descent has started from the South Peak side, it becomes a continues rocky trail untill you reached the open plains and paved road in San Juan Bano side. Dayhike of Estimated 8 Hrs, 10 kms. 0300 Assembly at Victory Liner Cubao EDSA South Bound. 0530 Take jeep bound to Magalang, Pampanga. NOTE: We hired a jeep on our arrival in SM Pampanga to take us to Brgy Ayala for the first registration, and the jump off. Guide: Optional, Php 400-500 range. Hiring a Jeep from SM Pampanga is an option if within a group, this eliminates all the tricycle expenses. Amount is negotiable with the driver, depending on the number of climbers. Hiring a van from Manila is also an option. Brgy Ayala side of Magalang do not require registration fee, only guide fee ranging from Php 400 - 500 and donation when passing the DENR entrance guarded by the Philippine Army. Each hiker or group of Hikers needed to be logged as this station would be responsible for rescue efforts if something where to happen. Brgy Juan Bano requires Php 20.00 registration fee wether you are Ascending or Descending on their side. Unfortunately, the rumors of extortion is well noted on this side. Caution is given in making negotiations like hiring a guide for traverse. These photos are all published in my Flickr Account. 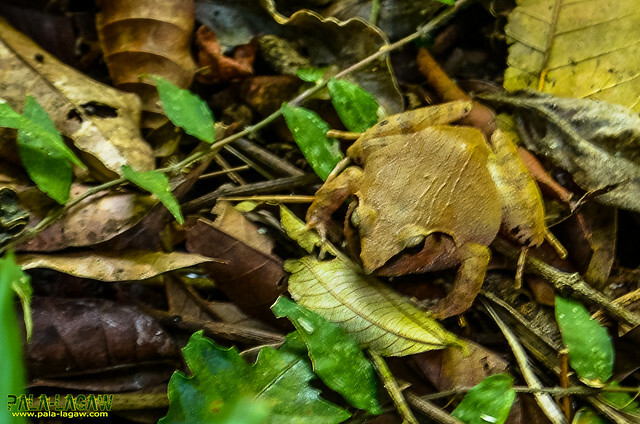 One of Mt Arayat's trail resident. 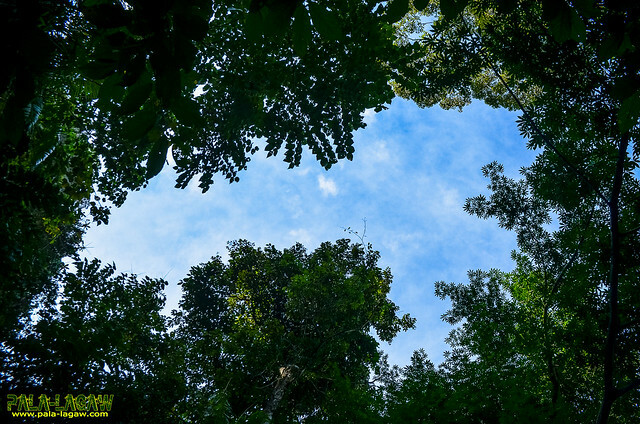 Some parts of forested trail has open canopy. 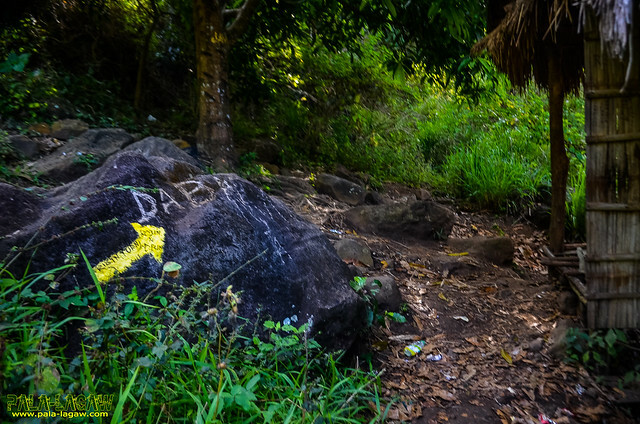 Trail markers in the Ayala side are painted in rock boulders. Tree tunnels make the assault hike pleasant. Peak 2 or sometimes reffered to a South Peak as seen from Peak 1 (North Peak). The summit is a bare patch of land, serves as the campsite and location of the tower and police outpost. Before that climbing down a vertical rock wall is this site with the sweeping view of Pampanga plains. Can you provide guide contact for Mt. Arayat hike po? Thanks po for the reply. Guide will be offered when you register. Sorry I cant provide any reco for that. hi. thanks for conquering mt.arayat. the peak 2 you are referring in the picture is not the south peak. it is the pinaccle peak. fyi, the the north peak is the highest, second is the south and the small one is the pinaccle.